For many of us, the early 1990’s were defined by two things: Northern Exposure, which ran from 1990 to 1995, and Sassy Magazine, which had its run from 1988 to 1996 (the last year was particularly sad, since the magazine suddenly transformed into a Teen clone). Well, that’s how it was for me anyway, a teenage girl during that time, having the feminist, diverse, unafraid tome of girlhood independence arrive by mail every month on the one hand, and having this intellectual, utterly charming and often times magical world on television every week on the other. The effect of both could not be more pronounced; for an extremely shy girl who barely spoke in class, these two influences were transformative. Suddenly, I realized that there were these cool women out there, girls that I wanted to be like, and they were smart, into art and culture, and not afraid to express their opinions. And so I was able to look beyond the small humiliations and pettiness of high school. Then there was the promise of this other world, a place where all sorts of individuals were loved for who they are, despite how different they are. It was a world in which you can find a soul mate in a stranger sitting on the bar stool next to you, and a world where people dream each other’s dreams when they went to sleep at night. These two things, Sassy and Northern Exposure, weren’t just escapes from everyday life, they were actually the things that made me want to live life. And so we arrive at the delightful intersection of these two amazing works of culture, in episode 3.3, “Oy, Wilderness.” How appropriate is it that the episode focuses on the long friendship of two young women from Saskatoon? In a scene where they make up after a fight, we see Cyndy curling Shelly’s hair, while Shelly reads the September 1990 issue of Sassy. Thus far portrayed as a little ditzy and shallow, the appearance of the magazine lends both girls a whole new depth, ’cause we all knew the kind of girls that read Sassy, right? Intelligent! Alternative! Decidedly NOT shallow! [Let us consider the choice of the September 1990 issue, which practically declares itself as the anti-Seventeen or Teen: a black(!) background; a non-generic dark-eyed, dark haired (cut short! ), ethnic model; the face off centre and in extreme close-up; stories like, “Ugly stories about puppy breeding,” and ”How gangs and sororities are the same.”] There is, of course more intersection between the two. Most happily. 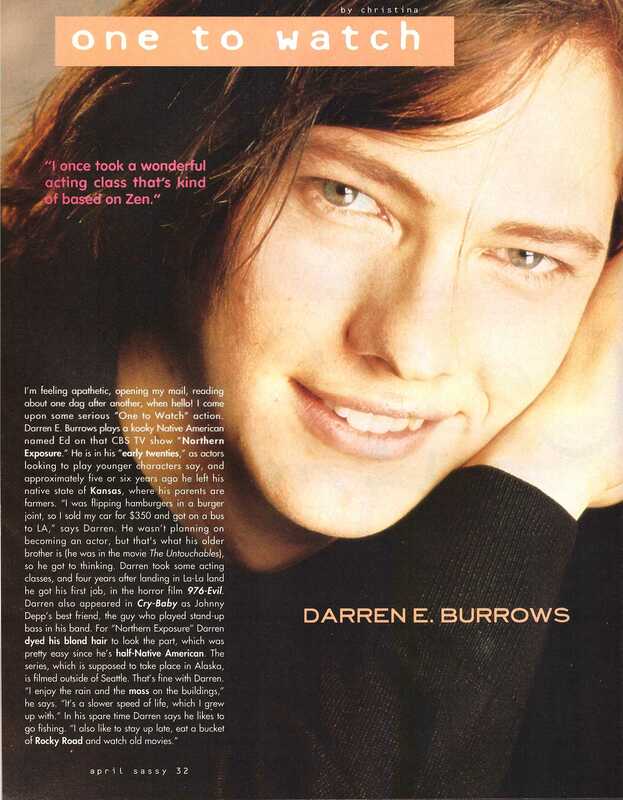 In the April 1991 issue of Sassy, Darren E. Burrows is declared “One to Watch” (a regular feature that showcases upcoming actors who are usually very easy on the eyes). 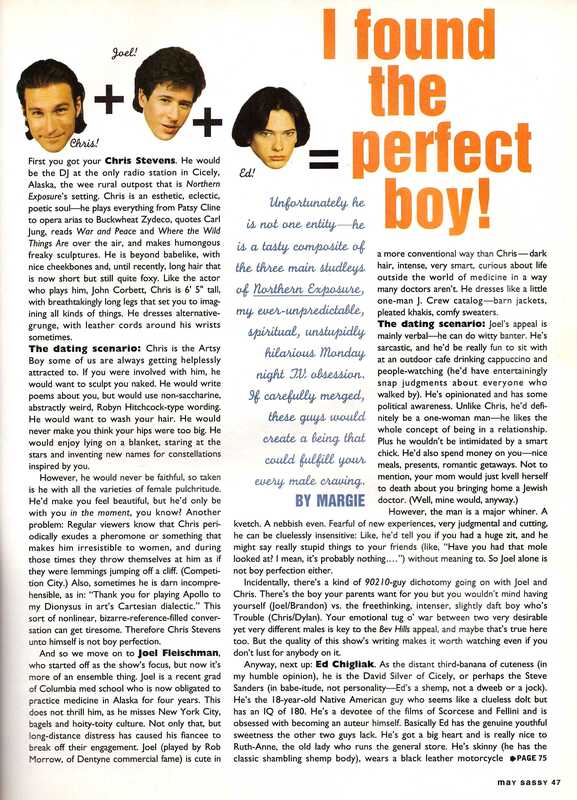 A little over a year later, in its May 1992 issue, a most memorable, wonderful article written by Margie Ingall appears in Sassy, called “I found the perfect boy!” She playfully proposes that the perfect boy is a combination of Chris, Joel, and Ed from Northern Exposure, a man who is at once artistic and intellectual, who can banter with you and get all sarcastic in a funny way, and a man who is also kind, gentle, and accepting of everyone. It is a heart-warming read, so very, very great. And, might I add, extremely right, though I myself would have placed Ed as being second most appealing. Both Sassy and Northern Exposure lasted the test of time. Want more? There is lots out there on Sassy, for example this most excellent tumblr dedicated to scanning pages of the magazine. There is even a 2007 book called (most appropriately) How Sassy Changed My LIfe. Of course, a whole new generation is rediscovering the magazine, like the fashion blogger prodigy Tavi Gevison. Enjoy.